Kate’s quilt ‘February Catkins, February Light’ captures the light and images that she sees on dog walks in February. She talks in detail about the design, choosing fabrics and making the quilt, as well as the adaptations she made to her process and physical sewing space enabling her to sew despite a back problem. Later Kate discusses her interest in quilt history (English and American), her own and her family’s connection with art and design, and where she gets inspiration for her quilts designs. 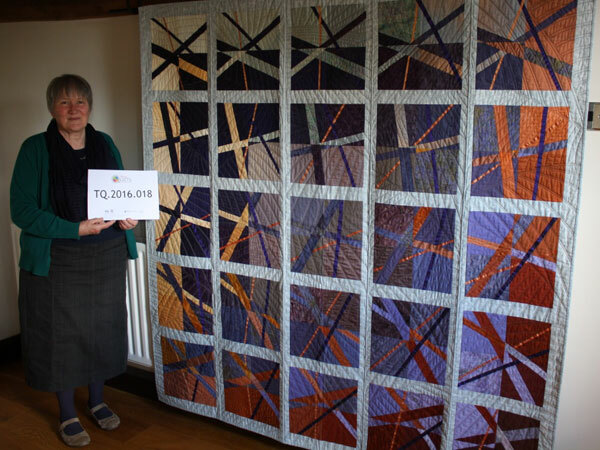 Denise Smith: Talking Quilts interview 2016.018. Interviewer Denise Smith. Interviewee Kate [Catherine] Brierley. Today is Monday 23rd May 2016 and the time is 11 o’ clock. Today I’m talking to Kate Brierley from Wolverhampton. Hello Kate. Kate Brierley [KB]: Hello Denise. DS: Thank you for bringing your quilt for us to talk about today. Would you like to tell me a little bit about it and shall we start with what you’ve decided to call the quilt? KB: I decided to call the quilt February Catkins February Light. And the reason is that the, I was particularly interested in the effect of Catkins on the trees during February while I was out walking with my dogs. And I was also very interested in the changing light, depending on the day, depending on the weather, how the light actually changed. And I am not somebody who does representational quilts but I wanted to get a feel of flickering movement in the way that I put it together. The blocks are basically four squares with intersecting lines of colour and I’ve enjoyed the search for all sorts of different coloured fabrics because all the fabrics are commercial fabrics. None of them have been hand dyed so there was great enjoyment in actually searching out the appropriate colours and the different tones that I wanted to use. It reminds me very much of walks with my dogs because it is a reflection of that particular period. It consists of 25 squares… each of which is made up of four squares so that mean that there are 100 squares in total. 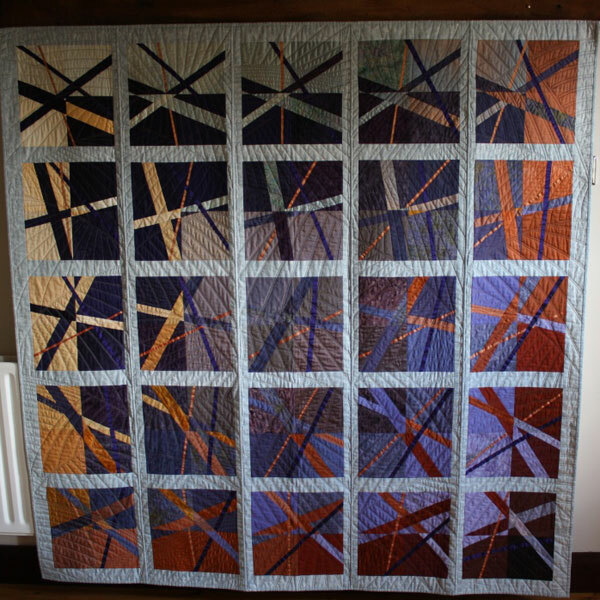 As I was making it, one of the main problems that I had was the fact that when it came to quilting it, I was not going to be able to deal with the complete quilt and as a consequence, it’s made in five long sections quilted separately and then joined together. I think the first thing that I would like to comment on is the technique that I used to actually make the blocks because I wanted it to be quite precise. I wanted things to match up quite exactly so I explored all sorts of ways of actually achieving this and in the process came across the use of freezer paper foundation piecing. And this enabled me to control all sorts of different fabrics because it includes silks and cotton sateen’s which are quite difficult to handle. And this particular technique means that everything is nice and secure so that I could get the accuracy that I wanted. That was, I felt was quite an achievement from my point of view. And then the second problem was actually quilting it because my interest lies mainly in the design of the top rather than the idea of using quilting. So I would describe myself as a piecer rather than a quilter. So the actual way of quilting the individual sections was quite a challenge. But I came up with a design which was reminiscent of ploughed fields which surrounded the areas that I walked in with the dogs. So that again has a, a sort of connection to the time that I’ve spent with the dogs. The colours are quite intricate in that I had drawn out various plans of where I was going to use the colour and how I was going to do it. And how it sort of reflected the idea of changing light and I’ve been very, I was very pleased with the finished result and it means a lot to me because of where all these ideas came from in the first place. And it also means quite a lot to me because I have won two prizes with it. The first was at Uttoxeter where I won the first prize in the Innovative Category and the second prize that I won was a third place at the Festival of Quilts in the Contemporary Quilt section. So it has quite a lot of very important memories for me. DS: Would you describe it as a contemporary modern quilt then? KB: I would describe it as a contemporary quilt although in recent times, in recent years the upsurge of the concept of modern quilting has mean that it has sort of moved into that category because there are a lot of neutral colours in it and there’s a lot of positive negative space in it which seems to be aspects of modern quilting. When I made it, the modern quilting category didn’t exist and so it went into contemporary, into the contemporary quilt section. But it’s not one that involves the addition of embellishment or painted surfaces or hand dyed fabrics. So in a way it fits more comfortably now into the modern quilt section although at the time, the only one that it would go into was the contemporary quilt. DS: You’ve mentioned the technique you’ve used which was foundation piecing. Would you like to describe that technique for people who are not familiar with it? KB: It’s quite a complicated technique in a way and it’s one of those things that people either love or hate. It involves quite a lot of very careful work and for some people they find that rather frustrating because they just want to get on and sew the fabric together. Basically what happens is that the block, the individual blocks are drawn out on the back of something that is referred to as freezer paper. It’s an American paper. It’s used in America to wrap food to go into the freezer but it’s also used for craft purposes. One side of the paper is just like ordinary drawing paper and the other side has a plastic coating to it. And what that will do is it enables you to draw on one side. You can draw straight lines or curves, it doesn’t matter. And then you can iron it onto fabric and the plastic side gives a temporary stick to the fabric so it holds it precisely in place. Then what will happen is that you can… oh it’s difficult to explain, I’ll try. You iron the freezer paper onto the reverse side of the fabric and then you place that against the right side of a second piece of fabric and then you machine through both layers of fabric and through the paper along the line that you’ve drawn and then, when that’s done, you can flip the second fabric over and iron it into place onto the freezer paper so that you get very crisp lines and the fabrics are held in place. There’s a lot of trimming involved. A lot of folding back of the paper and trimming things back to shape but you can actually produce quite complicated designs with this process. But it is quite difficult to explain in a few words. DS: There are advantages to using foundation piecing though aren’t there? KB: Oh yes, yes. I mean the advantages that I find are that I can get things very precise and I can control very small pieces of fabric. But at the same time, it gives me freedom to actually produce designs that I would not be able to do using a conventional method of just sewing fabrics together. DS: Can we talk a little bit more about the fabrics and the colours that you’ve used in the quilt because they are beautiful. KB: Yes. The, the fabrics include quite a lot of cottons, silks, cotton sateen’s and silk cotton mixes. Although quite a few of the fabrics are plain, most of them have some sort of textural sort of pattern to it. Either in the way that it’s being dyed or in the pattern that’s been applied to it. There are some batiks and what I suppose you might call sort of background textural patterns rather than well-defined patterns. The colours range from quite dark tans through to through burnt oranges and soft golden creams. But also from very pale greens through to pale mauve’s, dark mauve’s, blues. So it’s a very rich mixture of different colours and these all come from the experience of actually seeing light on trees and Catkins in particular during the month of February when I was out walking and the skies, the colour of the skies at different times of the day. In particular in the late afternoons when the sun’s very low. It can quite often create beautiful glowing effects with the branches of the trees against the sun. DS: So, how did you go about the design of this quilt Kate? Did you take photographs or? KB: I took quite a lot of photographs but one of the things that I find about photographs is that when I actually look at the photographs I don’t quite get the same impression that I’ve had in my head. I’ve got quite a good photographic memory and I can visualize how things are actually going to go together and I can remember very clearly images from my walks and so on [coughs]. Excuse me. And I knew right from the start that I didn’t want to do something that was a picture of the Catkins. But what fascinated me was the structure of the branches of the trees and then the movement of the Catkins In the breeze and this sort of flickering movement of these pale, yellowy green, almost alive little things hanging from the trees. And some I sat down, I work most of the time on squared paper and I sat down with my pad of squared paper and worked out how I could actually get something that suggested the branches of the trees and also this sense of movement so the lines, although they’re straight lines, each block is different in that the position of the lines alters slightly in each block and this creates a sense of movement across the quilt. There are some things that are constant because it was just easier to keep certain pieces constant but generally speaking the actual position of the lines, each block has four squares in it and it also has four lines crossing the squares. And the lines are slightly different each one. Each of the 25 blocks is slightly different in the position of the lines and this gives a sense of movement. The colour has been applied so that there’s a central square that goes from diagonally dark in one corner to light in the opposite corner and then there’s a band of colour around that that is the opposite way round. And then there’s a further band of colour around it which goes back. So one particular corner is very light with the dark against it and the opposite diagonal corner is the other way around. So it will be dark with light against it. KB: Yes, it’s done on a domestic machine and it… the trick with that was to start in the centre of each section and work out from the centre to keep everything going quite nicely. And also I made the decision that I wasn’t going to have any lose ends of quilting that had to be finished off. So all the stitching comes from the edge inwards and gradually works across to the other side. And I used masking tape which I positioned on the top and then just stitched along the edge of the masking tape then moved the tape into another position and continued. And I used a thread which is a variegated thread, it’s one of Oliver Twist’s threads which is, it just has, is very subtle change of colour. It’s nothing dramatic but it just changes slightly as it goes across. And I also used a long stitch in the quilting so it’s not, it’s not a short stitch but, I can’t remember how long it is but it is quite a long stitch. But it was, it was done on just an ordinary machine. Actually it was done on a Pfaff machine that only does straight stitching. It doesn’t do anything else fancy so, but it’s an absolutely lovely machine for this type of work. DS: So when was it actually made? KB: I can’t remember. I think it’s two thousand and eight… I think it’s over, the labels on that corner. DS: And as we said you were the prize winner. DS: Can you remember what you won? KB: [Laughs] At the Festival of Quilts is was £250.00 [laughs]. KB: At Uttoxeter it was a bag of goodies which included… fabric that you could put through the printer to print on. It, I think there was a video, a quilt program to go on the computer, quilt design program to go on the computer and various other things that I can’t remember now but I can remember at the time being absolutely amazed at the quantity of stuff that I was given and much of it came with its price on which was quite amusing. But it added up to nearly £100.00. DS: Oh lovely. And did you get the all-important rosette? KB: Yes I did [DS laughs] and a certificate [laughs]. DS: And where’s it kept now? KB: It’s, it’s kept sometimes sort of draped over a chair or in a cupboard but it comes out quite frequently because I do talks and demonstrations and it’s very popular as far as that’s concerned so it comes with me. It travels a lot with me to different places for people to have a look at. DS: Is it a special place in your heart as well? DS: Was it your first prize winner? KB: Yes. And only [laughs]. DS: There’s plenty of time. I don’t think we said how big it was because it’s a lovely big quilt. KB: Yes it’s about 71 inches square. DS: And it’s got a hanging sleeve and a label. KB: Yes. And, it’s, as I said it’s made in five sections and the reason for that is that I unfortunately have a problem with my back and I can’t sit at my sewing machine so everything has to be done standing up. I can’t deal with a large quilt now so I have to make… I choose to make them in sections and then I can actually control it and deal with it. DS: So you actually quilt each section before joining them together? DS: That’s really interesting isn’t it. KB: But I make the size, the sections the size that I can deal with quite easily on the sewing machine. And then I have a way of joining it together. The best way I can describe that is I have a very large work table and then a small table that I put at right angles to it. The sewing machine goes onto the small table and the large table takes the weight of the quilt. So I’m not struggling at any point to actually manipulate the quilt. So when I need to do bindings, say bindings on or joining sections together, the whole weight of the quilt is taken by the table and it just, you just push it through the machine. It’s very easy to do and it’s a, a way that I would suggest people actually approach any sort of quilting because it’s one of those peculiar things that the books quite often say about having plenty of space the other side of the sewing machine from you. But for me, the most important thing is to have it to the left of the sewing machine so that the quilt is always on the table. It’s never draped down to pull it out of place or out of position. DS: Actually looking at the quilt you would think it was one whole quilt rather than being joined. It’s not until you actually look into it that you can see that it’s been joined in sections. KB: Yes. I’ve used each of the blocks has a sort of mottled grey sashing around it and the joins are within the sashing so you don’t actually see it particularly. But I have actually put the binding over the top on the top side of the quilt rather than on the back of the quilt because on the back it seems it would appear that there is just a seam. Whereas on the front it’s a raised section. 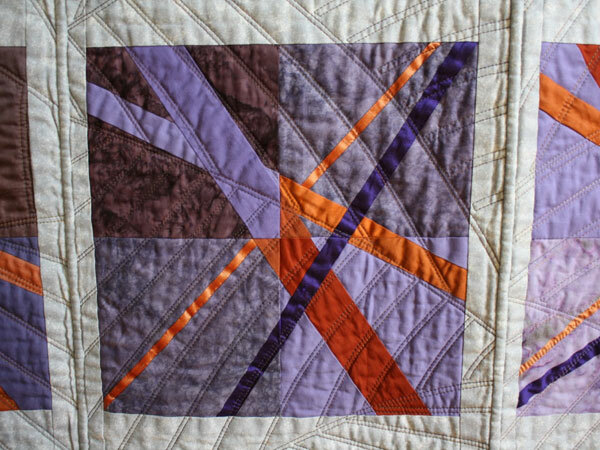 And the reason that I’ve done that is that I think it actually adds a nice detail to the quilt because it’s almost like a piping that goes down the middle of the sashing between the blocks. And this adds a little bit of shadow difference to it which I think makes a little added interest, visual interest to it. DS: Yes, it’s really lovely. And do you remember when you first discovered patchwork and quilting? KB: Yes I do. I don’t have any patchwork and quilting in my family history although there’s a lot of sewing and knitting and various other things, but nothing to do with patchwork. But I’ve always been interested in things like mosaics and geometric patterns. Even as a small child I was very interested in any that had got geometric patterns in. And then one day I was watching the television with my two children when they were really quite small and, I can’t remember what I was doing but, we happened to be watching a John Wayne Western and in the Western they were using these amazing quilts as divisions in a cabin so that the boys could be one side and the girls could be the other. And I sat there looking at it and thinking, ‘Oh, my goodness,’ and as always I’ve got pencil and paper around I can remember sitting, actually drawing the designs from the television screen. And I think that’s the first time I’d actually come across something that was so amazing. So the next step was, ‘cos this is going back to probably about 1972/3 that sort of time. So no Internet or anything like that so it was a trip to the library to find out what this was all about and it developed from there. So that was my first experience of quilt. DS: And then onto books I presume? DS: Do you remember the books that inspired you even more? KB: Yes. The first um, I can’t remember what I actually got out of the library but I can remember sort of actually finding this little section that had got some quilts in. But the first book that I actually got hold of which I still have is called Patchwork by Avril Colby. And, there’s a second one that’s in my bag and I can’t remember the title of it [laughs]. DS: Is she an American lady or an English lady? KB: And, it’s black and white pictures but it’s about the history of quilting or patchwork rather and it’s quite a serious book in a way, you know. It’s a, it’s a proper sort of piece of investigation and so on but there’s also information about techniques and then I found a Dover book that was lots of quilt patterns and that Dover, is an American book. And so they’re all based on blocks and that was, again, a tremendous source of fascination as far as I was concerned. So it was, the main thing that I was really intrigued by was the fact that every quilt design had a name. And also, it’s to do with the fact that the people that actually made these quilts were just very ordinary people and they were making covers for the beds that were very very attractive and the designs had names that reflected the lifestyle that they led. So you have things like Log Cabin, Saw Tooth and all sorts of other names that you would associate with the American Wild West because that’s when they date from. And I found that particularly intriguing, the history of the quilts as well. And also from the Avril Colby book, the fact that American quilts are basically blocks that are then sewn together and then quilted. Whereas in England, quilts are what are referred to as Medallion where they start with the central pattern and then borders are added around that centre. So you have a central square or rectangle and then strips of pattern are added round it. And it’s quite noticeable in the old quilts, the different between the two approaches. But the history of it I found absolutely fascinating and my first attempts were to do with what’s referred to as English piecing where you cover pieces of paper with fabric and then join them together. And hexagons figured quite heavily at that particular time [laughs] and one of the earliest pieces that I did. They were, I did very small pieces to start with and I did two cushion covers which were what’s referred to as Grandmother’s Garden which is basically a hexagon surrounded by six hexagons that suggest the flower. And then around that it usually a plain fabric which suggests the path walking through the garden. And I made a cushion cover for myself and one for my mother as I thought she would find it quite amusing because she was quite a keen gardener and uh, unfortunately, although I still have mine, hers got destroyed in a fire at the, where she was living so [laughs]. She was alright though. DS: That’s good. That’s good news. DS: Do you spend a lot of time quilting or is it, does it take up most of your free time or? KB: It does now. When I was working, it, because I was a teacher. It was primarily something that happened during holidays. I didn’t do an awful lot while I was actually, during the term time at work. There was too much else to do but I would usually get involved in doing something during the holidays and quilts would take quite a long time to do. Well, I suppose initially things were quite small so, you know, that wasn’t so much of a problem but larger quilts took quite a long time to do. The first full size quilt I did was based on the Amish design, Trip Around The World which is basically squares and it starts with a square in the centre and then, but it’s on point so it’s not square to the border but diamond shape. And then it has a line of another colour going around that and then further colours. So each line of squares is sort of going around the world which is at the centre. But true to myself I can’t follow other people’s patterns so it got changed and it landed up being called Hydrangea Dry because I use the colours that you found in dry Hydrangea flowers and it’s basically it’s sort of four big petal shapes. But it’s, that was the first one that I did and it measures, I think probably about six foot square. How on earth I actually managed to get it square and put the borders on I have no idea. Apart from the fact that I have memories of crawling around all over the floor trying to do it. But when I look at it know I’m absolutely amazed that it’s as square as it is [laughs] and as flat as it is. But that was the first full size one and that was probably made about 1983 or 4. DS: Do you always machine quilt your quilts or do you ever attempt any hand? KB: In the early days because I was learning from books. Because I’ve never been to workshops or things to actually learn how to do things, I tend to just go to books and find out for myself. Actually work out how to do things myself. So from my treasured books, yes, I attempted hand quilting and I was absolutely rubbish at it. I thought, ‘No, I can’t do this’. And then I discovered that actually you could do it by machine and so I always do it by machine now and not only that but, I can’t sit to sew. I can’t sit in the right position to sew anymore so it has to be done by machine. DS: Do you have your own sewing room at home? KB: Yes, I do. But I will admit to the fact that I’ve also invaded our front room, our sitting room. So amongst the television and the settees and so one, there’s a large worktable with a sewing machine on it. It has been there for a good few years [laughs] and because of the fact that I use my sewing machine standing up I need a slightly higher surface to work on so John, my husband has built me a second layer to the table so it’s just an ordinary table but it’s got a second, very short legged table on top of it that my sewing machine sits on. And that brings the machine up to elbow height I suppose would be a good way of describing it when I’m standing. So it’s level with my elbows. DS: And do you pass on these tips? There must be a lot of disabled people who want to quilt who know they’ve had to stop because of different problems. Do you pass on your tips to people? KB: There have been several occasions when I’ve talked to people about the fact that I have, what happened. I can just explain it this way was that I was finding that as I was sitting sewing, I was getting terrible pain and the only way to relieve it was to stand up. And then I realised that it was actually working at the sewing machine that was making it worse. And so I thought well I’m not, I want to continue to sew, I need to find a way round it. And so I’ve devised the way where I control the fabric with my left hand and I control the foot pedal with my right hand. So it limits the type of sewing that I can do although I’m pretty good at it now after quite a bit of practise. And there have been quite a few occasions when I’ve been talking to other people at workshops and demonstrations about the way that I approach it. I haven’t spoken specifically to people who are disabled about it but, a lot of people have been interested and there was one particular lady, I can remember, who was really quite taken by it. I was stewarding at an exhibition of work and she was really intrigued about what I was saying and she decided that she was gonna go home and have a go herself because she was also finding it difficult to sit at a sewing machine but she didn’t want to give up sewing. DS: Might be a good technique for a lot of us to learn ‘cos we all spend a bit too much time sitting don’t we? DS: A little bit more mobile. KB: And also because I’m one of these people I hate ironing. I really hate ironing but I am the most dedicated presser as far as fabric is concerned when I’m making quilts. I press everything, the whole time. I don’t have my ironing board in the front room with my sewing machine. I have it in the kitchen. And this means that I have to walk from my sewing machine to the kitchen and back and that’s really very good for me as well [laughs]. DS: That’s an excellent tip, isn’t it? KB: Yes. It’s, and also, it’s this sense that you can get so sort of bogged down working in the same place the whole time and I quite deliberately, somebody said to me the other day, ‘Why don’t you have your ironing board beside your sewing machine?’ But I don’t want it there. I want to walk through to another room to actually do it. DS: Good idea. Thank you. You designed this quilt that we’ve got here today so do you design more of your quilts now or do you ever start with a pattern and perhaps adjust it? KB: No. I never start with a pattern. Everything I do is something that I’ve designed myself. It’s always, [coughs] excuse me. It’s always in response to things that I see around me. So as with this quilt which was in response to the Catkins on the trees, everything that I do has some sort of relationship to things that I’ve seen. Even if it’s just the spotlights on… The Voice. The actual, if anybody’s watched The Voice on television, there’s a lot of use of spotlights that arc across the screen and I’m absolutely fascinated by that. And there’s a very distinct possibility that there will be a quilt based on that coming soon [laughs]. DS: So has art and design been a part of your life? KB: Yes, yes. It always has been. 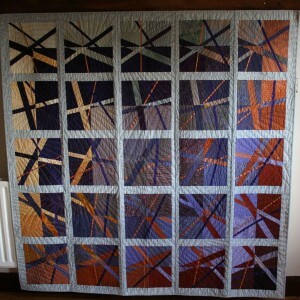 I, whereas quilting wasn’t something that was part of the family, art and design is something that’s part of the family. My brother is 11 years older than me and he went to Art College when I was six and so there’s always been that association. And I found out recently that my grandfather was also a painter which I didn’t know before but, it seems that it’s always been part of the family and so it was almost natural that I would go to Art College once I finished at school. And then I’ve taught Art and Design to 11-18 year old’s for many years. So yes, it’s always been part of my life since I can remember. DS: So with your design of your quilts what else influences you? You mentioned photography and nature and light and shadow. Is there anything else that influences it? What about different types of art from around the world? KB: Yes. There are particular artists who’s work I particularly admire. For a lot of people they would sort of say ‘Oh I don’t think much of that’, because my main interest is with abstract art and in particular people like Joseph Albers and he is a, a very big influence because he was an amazing teacher and he has, there are various books about his teaching methods and the sort of basic design qualities and the use of colour. And there’s one particular one which is called the interaction of colour and colour really is one of my obsessions. I will admit to the fact that I have a miniature library of books on colour and so I think there are sort of a group of artists who have been very influential always throughout sort of my art career and so on. But the funny thing is that I’m not a painter as such. I recognise that fact very early on that I wasn’t a painter. I think I’m probably better described as being somebody who designs with colour rather than a painter. Oh, there are other people whose names might be familiar. There’s a lady called Bridget Riley who did the Op Art images. Black and white stripes moving across the surface. But there’s another person whose work I admire who’s called Tess Duray and, in a way, a lot of her paintings are like quilts to look at and I supposed what I do is, I don’t copy what these people do, but I am influenced by the way that they work and that, I think, reassures me that I can actually produce these designs albeit in fabric rather than in paint. I’m trying to think who else. I think those are probably the main people. Oh, and there’s another chap that I’ve come across recently called Paul Feeler and again, his work is very abstract but he works a lot with different tones of colour. And that links up with the way that I work because I like to use different tones of colour within my work. So rather than using different fabrics that have different patterns on them, I’ll go for a range of different tones within one colour or within a range of colour. So going from perhaps, as in this quilt that we have in front of us, from the very pale creams right through to the dark rich tans. Or from the very pale mauve’s and greys through to the very deep purples. So I enjoy working with tone. DS: Do you only use your graph paper or do you use any technology to design your quilts? KB: I’ve had a go at working on a computer program to design quilts but, I wasn’t particularly impressed with it. I found it rather frustrating and I thought the time I’m sitting here at the computer messing with this programme I may as well just get on and draw it. However, I have used things like Photoshop to manipulate things that, images and so on. There are various things on that that allow you to distort or put things into perspective and so on which I found quite interesting. But I don’t do it a tremendous amount. Most of it is just done on graph paper. And I also work in pencil. I don’t work in colour because what I’m particularly interested in is the tonal variation and so if I’ve got things right as far as the tone is concerned in the design in pencil, then I can use whatever colour I want on that. So again, I had somebody say to me, ‘Why don’t you use coloured pencils to do it?’ but there isn’t a lot of point as far as I’m concerned. I work in different shades of pencil and then I’ll go and find all the fabrics that I want to actually match those tones and I’ve got this sort of strange ability that I can actually visualise what it’s going to look like. So I don’t need to go through the process of colour. But I do however, put samples of colour together and sort of keep a record of things that are, the colours that I want to use and so I’ve got quite sort of detailed records of the colours that I’ve used on particular quilts. The fabrics, you know little swatches of colour which sounds very sad [laughs]. KB: No, it’s the design. It… what comes first is the colour. So whatever it is it’s, whatever I see, it’s the colour and the, perhaps the repeat pattern that I can see. DS: Is that a visualisation is it? KB: Yes. Yes. And I will look round. I was talking to somebody the other day at Uttoxeter where we’d got an exhibition of work. And one of the ladies that was speaking to me asked that question as well. And I was sort of trying to explain to her and I pointed to something that was outside which was basically one of the buildings that we could see through the window. And I was explaining to her that I found it quite fascinating, the combination of the horizontal design created by the wooden cladding against the vertical design of the, I can’t think what you call them. It was a window with one of those um… screens, protection screens on it. But it had a vertical design on it and the, the part on the left was this vertical design of this protection grid which was light against the dark of the window. But on the right hand side, where it was the cladding it was the opposite way around. So it was the, sort of the tonal change across the two and she stood there and looked at me and went, ‘Oh right!’ [laughs] I think she understood what I was talking about but it was just trying to give an example of where the Ideas actually come from. DS: So you’re use, you use commercial fabrics? DS: You never hand dye? KB: No, although some of the fabrics that I use are hand dyed but they have been bought commercially. So the cotton sateen here have been dyed by a lady called Heidi Stowell-Webber and she’s a German lady, she comes from Frankfurt. But she travels to the Festival of Quilts every year and brings these bolts of absolutely stunning hand dyed cotton sateen fabrics that I have to buy. And I go to the Festival of Quilts knowing that I’m going to spend far too much money on the fabric. And I only ever buy from her [laughs] mainly. Practically only ever buy from her. DS: That’s good. Have you got a favourite colour that you sort of tend to use? Or do you have a mixed pallet? KB: Um… mixed pallet but I tend to move towards the purple-e side of the colour spectrum. Although, you know, quilts that I’ve made they vary quite a lot. But I also like neutral colours. The funny thing is that when I go back to the very first quilt that I made, all those years ago, I wanted very very dark colours and very light colours. [Coughs] Excuse me. But I made a decision I wasn’t going to use black and white and at that point I’d discovered a company called Strawberry Fayre. It’s a mail order only company and they send out these amazing samples of fabric. I think it’s 12 First Class stamps for an envelope of about 300 little squares of different fabrics which I was completely amazed by. It was absolutely delighting, delighted to sit and look at these things and so I selected fabrics from there and noticed that there was some really dark fabrics that weren’t black but they were very very dark purples, greens, blues, browns and then very, very pale fabrics as well which again, weren’t white but were very very pale. Very very pale greys and blues and so on. And, so that was sort of a decision I made at that point. And I’ve seemed to have stuck to that, that I don’t, I’m not keen on using just a flat black fabric or a bleached white. I like fabrics that have just a little hint of colour to them or a little bit of movement away from just the solid black or white. DS: You can see that in this quilt that we’ve got here today. KB: And also I, a lot of people have made comments about, ‘Oh why don’t you dye your fabrics?’ I’m not interested in actually dyeing my fabrics. I’m interested in making the quilts and I’m also interested in the idea that if I go out and buy fabric, or I go and look for fabric, I can quite often have in my mind a particular colour that I want. But it’s not available and so I have to think about the possibility of using something slightly different. And that I think is a very intriguing challenge that I can make use of what’s available rather than trying to dye something to meet what I think I want. And, because I find it, actually it throws up very interesting possibilities because it literally is, ‘Oh I wouldn’t have thought of that’, but actually that’s a better decision than the one that I thought I’d made. KB: I tend not to go for fabrics with a lot of pattern in them, because that again is not really what I’m interested in. Many of the fabrics that I’ve got have got some sort of mottled or small design on them that adds a little bit of texture to it. But I don’t really go for sort of big designs most of the time. DS: No. You mentioned Festival of Quilts a few minutes ago. Does, and so my question is do you attend many quilt shows? KB: I don’t, well this is a peculiar situation. I don’t go to a lot of quilt shows just as a quilt show visitor, but I do belong to a group who exhibits at quilt shows and I often go to quilt shows as a steward of our exhibition [laughs]. DS: So what group would that be? KB: It’s call Eclectica. And our numbers have just gone up slightly but there are now the grand total of nine of us and it, we’re a group of people who just like textiles. And we like producing work to put into exhibitions from time to time. We meet once a month and we talk about we’re doing. We show each other what we’ve been doing. We might talk about a book that we’ve come across or a new technique that people have come across. There are two of us, well actually no that’s not quite true. There are now three of us who are what you might describe as quilters. The rest are people who come from embroidery, mixed media, textiles. So the work is very varied and that’s why it’s called Eclectica because nobody works in a similar way. And it covers all sorts of different approaches and techniques. So we’re not a quilt group as such, we describe ourselves as being textile artists which sounds quite grand. DS: And do you put on exhibitions? KB: We go to different places to exhibit our work. Quite often they will be quilt shows so they will be three or four days. 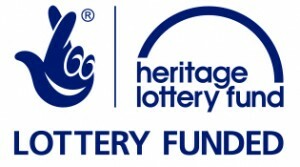 But occasionally we have longer exhibitions so um, this summer we have an exhibition in Worcester Cathedral and we’ve exhibited in Forge Museum in Redditch and Himley Hall and one or two other venues where there have been sort of longer exhibitions. But mostly they’ll be three or four days. Oh, Bilston Craft Gallery, we’ve also exhibited in. If it’s a short exhibition then we have to steward so we, over it’s say four days, then we’ll, each of us will do a day. We try to share so that we’re not sort of stranded for the whole day. If it’s a longer exhibition then they don’t usually need to be stewarded. Although the venues quite often like you to go along to perhaps demonstrate or something for a day so that visitors can come and see what you’re doing. 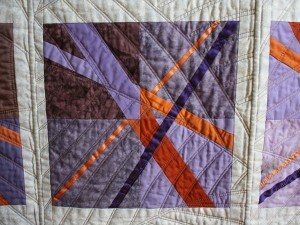 DS: Do you think it’s important for quilters to exhibit their work? KB: I think a lot of people who actually are involved in making quilts are extremely modest about what they do. They don’t realize how absolutely stunning their work is. And I quite often find people saying, ‘Oh, no my works not good enough to put into a competition’, and invariable it is good enough. And if you go around quilt shows you see a tremendous variety of workmanship and also you see a tremendous variety of design. And I think that it is a wonderful experience for people to actually put their work into a show and to actually have it on display for other people to see. I think sometimes people feel that, or they’re bragging if they do that. But they’re not really, they’re just allowed other people to see how marvellous, to see a marvellous piece of work. So I think exhibiting from that point of view is, you know, is a wonderful experience. And I also from my point of view, I enjoy putting work on exhibition and then talking to people about what’s on show. And the people that come and have a look are usually really interested in seeing what’s being done and talking about how it’s being done and all that sort of thing. So I think that’s very beneficial as well. DS: You’ve spoken about that you do workshops. Have you ever written any articles for magazines? KB: No I haven’t actually. I’ve [laughs] though on the other hand I’ve illustrated an article for a magazine. For… somebody in Wombourne Quilters. No, actually when I think about it, when you say articles for magazines, yes I have but it’s on a sort of quite a small scale because I write pieces that go into the Contemporary Quilt Magazine that’s produced by The Quilters’ Guild, contemporary quilt group. If that makes sense? KB: And I have written several pieces over the years and currently, this is just complete proof that what I’ve said previously was a complete lie. I’m currently in the process of writing a series of articles about Carla [laughs]. So I lie [laughs]. No I, that started because I made a comment on the Contemporary Quilt Yahoo group. It’s something to do with colour and the lady who is the editor of the magazine contacted me and said, ‘Would I be interested in writing these articles?’ and so I said, ‘Yes, I’d have a go’. And I’m about to, I think, submit the fourth in the series. DS: Fourth out of how many? KB: I don’t know [laughs]. I think the total number will depend on when she gets sick and tired of getting these things through [laughs]. No, she did actually ask me for one just recently so. KB: Yes, I quite enjoy doing it and it’s about colour which is sort of my passion and it’s about all sorts of silly bits and pieces in connection with it. I try not to make them too tediously boring but I think what started it was that there was a discussion about the fact that somebody was commenting that on the website that the colour of the fabric that you buy online, isn’t always what you see on the computer. And so one of my little articles was about the fact that there’s a tremendous amount of endeavour about getting colours right and matching colours and the fact that the calibration of the computer monitor can determine what you actually see. And it may not be the same as if your computer, if your personal monitor isn’t calibrated properly then what you see on screen isn’t what they’ve actually put on screen in the first place. So it’s, and then the problem is when you print something out, if the printers not calibrated as well you get a completely different result anyway which sounds very technical, tedious. DS: Be interested to read the article actually. So are you a member of The Quilters’ Guild? 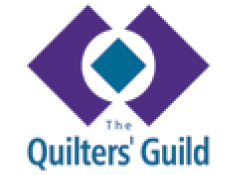 KB: Yes, I am a member of The Quilters’ Guild. DS: Have you been a member for a long while? KB: Yes, I have. I’m not somebody that actually joins things normally but probably about two or three years before I came up to retirement I went to the Festival of Quilts and while I was there I thought, ‘I’ll join The Quilters’ Guild’, and got really no idea what it was actually going to entail but it was primarily because I knew that once I’d retired from teaching, I was going to design and make quilts. That’s what I wanted to do. So I thought, ‘Well, let’s join The Quilters’ Guild. See what it’s all about,’ ‘cos I’d really got [laughs] very little idea of what this world of quilting was about apart from what I’ve done myself and then as a result of that I joined the Contemporary Quilt Group and I’ve now also joined the Modern Quilt Group. DS: That’s Eclectica. Quilters’ Guild, Modern Quilt Group and the Contemporary Group. And that’s all from, lead from Quilters’ Guild did it? DS: So it helped with your social life as well? You branched out. KB: Yes it’s, I’ve met a lot of people through that and uh, uh… I’ve even gone to the point of putting my, I think the posh word is ‘Profile’ on The Quilters’ Guild Website and I’ve had one or two people contact me, you know, for talks and workshops and things through that as well. So it’s, you know, it’s broadened things out quite a lot really. DS: And are you a member of any local groups? DS: Have you been a member there a long while? 01:05:27 KB: I’ve been a member of Wombourne Quilter’s for just a little bit shorter time than I’ve been a member of The Quilters’ Guild. Because it was through The Quilters’ Guild that I found out about Wombourne Quilters and realised that it was local to where I live and so phoned up somebody and said, ‘Can I come to one of your meetings?’. DS: Are you an active member of the group or do you just go along to see what’s going on? KB: Yes, I am an active member of the group. I’ve been group leader and I’ve been on the Committee for quite some time and very… surprisingly very passionate about… keeping the group running and hopefully enthusing people to continue with this craft. DS: So just one last question. Why is quilting an important part of your life do you think? KB: I think it’s important because… it enables me to work with colour but also to stitch at the same time. Because I love the feel to quilts. I love the feel of actually sewing and the sensation that you get from holding a quilt when it’s finished I think is absolutely marvellous. And also I think it’s become quite important because it’s a means through which I can express my ideas. Which is a very selfish, self-centred sort of thing in a way but that’s important to me and it’s also enabled me to meet quite a variety of people and to travel quite a bit, and it’s just, I just like it. DS: Brilliant, lovely answer. Thank you very much Kate.